While some people exercise to improve endurance or increase their strength, you may want to exercise just to burn calories so you can lose weight. This is a legitimate goal because, according to the textbook “Sports and Exercise Nutrition,” the most important action you can take to lose weight is to expend more calories than you consume. Your problem may be, however, that you have little time to exercise. If so, your objective should be to perform exercises that burn the most calories in the shortest time. There are several exercises you can do regularly to achieve this goal. Biking is a low-impact, calorie-burning exercise. This means it does not stress your joints as much as exercises such as running or jumping rope, in which your feet contact the ground repeatedly. Low-impact exercises are effective for everyone, but may be your preference if you suffer from joint pain or stiffness. 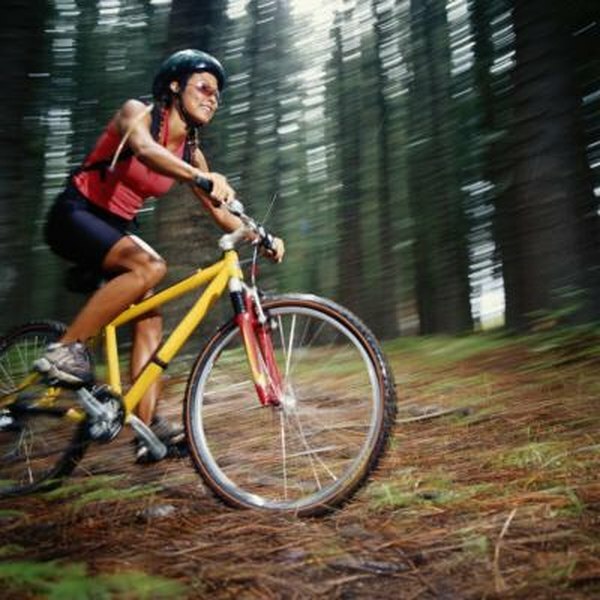 Logically, biking is a more effective calorie-burning exercise if you pedal hard to go faster. According to "Sports and Exercise Nutrition," if you weigh 150 pounds, you will burn about 250 calories per hour if you bike slowly (5.5 miles per hour), 400 calories at a moderate pace (9.4 miles per hour), and 600 calories if you bike as fast as possible. Running is a popular calorie-burning exercise. If you live in an urban area, you likely see someone running for exercise daily. Unlike biking, it is a high-impact exercise and thus puts more stress on your joints, especially your ankle and knee joints. If you choose to run for exercise, wear shoes designed to absorb some of the impact forces. Assuming you weigh 150 pounds, you will burn approximately 600 calories per hour if you run at a slow pace (10 to 11 minutes per mile). You will burn calories at a higher rate the faster you run. Along with burning calories, jumping rope helps strengthen the bones and muscles of your lower legs. Like running, jumping rope is a high-impact activity, so be sure to wear appropriate footwear. If you weigh 150 pounds and jump rope for 15 minutes, you will burn about 150 calories. Resistance training does not burn as many calories during exercise as activities such as biking and running. It helps build muscles, which will increase your metabolism and cause you to burn slightly more calories at rest, according to James S. Fell, writing in the "Los Angeles Times." While lifting weights, you will burn about 350 to 450 calories per hour if you weigh 150 pounds.